Don’t get me wrong – I like a good ruin as much as the next guy. Give me a big pile of crumbling stone and I’ll clamber happily on it for hours. Throw in a little history and some atmospheric surroundings and I’m in heaven – whether it’s the Parthenon, the pagodas of Bagan, or the pyramids at Giza. But even the most spectacular ruins pale after a few hours in the tropical heat of South East Asia, as my wife and I discovered recently during a two-week trip to Cambodia. We had come to see as much of the vast network of temples around Angkor as we could, from the famous Angkor Wat to remote sites only recently cleared from the jungle. And at first, we were really determined about it, getting up at dawn and staying in the ruins until evening. But as the days wore on – usually in 100-degree heat, with high humidity and sun so brutal it made your brain melt -- we finally took a break. And that’s when we discovered the amazing town of Siem Reap. 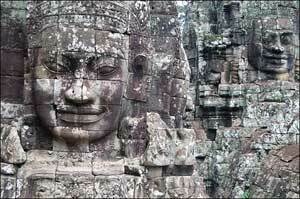 If you’ve been to Angkor, you’ve been to Siem Reap, where all the hotels and restaurants are located. But if you were there more than a few years ago, you won’t recognize the place. On my first trip, in 1999, it was just a dusty little backwater with a couple of teashops and some cheesy, Chinese-built hotels on the road to the airport. The most exciting thing about it was leaving. But tourism has exploded in Angkor over the past decade, and Siem Reap has turned into the liveliest, hippest place in Cambodia. The town has woken up -- more than a hundred new hotels have sprung up (many of them luxurious five-star palaces) and new restaurants, guest houses, clubs, spas, art galleries, internet cafes and bookstores seem to open up every week. It’s still got its small town charm, but with an unmistakable buzz. And while the temples will always be the main draw, Siem Reap is starting to turn into a pretty interesting destination on its own. And for us –- drained after too much sun, stone and ancient history -- it was blessed relief. We lazed our way around the narrow, shady streets of the old French Quarter, talking with people and exploring. There’s a lot of traditional Cambodian life going on, but it’s mixed up with ultra-modern boutiques, lively bars and smart little cafes that look like they were just airdropped in from Paris. 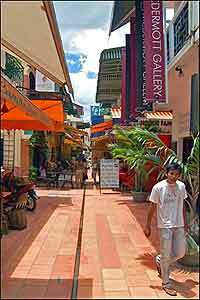 The feel of the place is completely informal; Siem Reap is so casual, in fact, that most of the streets don’t even have names. And we kept stumbling across the unexpected – fried spiders in outdoor food markets, contemporary art in the McDermott Gallery, a place called Herb’s that serves marijuana pizza, an extremely cool one-room luxury hotel called the One Hotel and – our favorite -- a netted courtyard restaurant called the Butterfly Garden, where we idled away a morning eating blueberry pancakes ($4), while hundreds of butterflies fluttered around us. There’s a lot of worthy stuff to do in town – museums and so on – and activities like mountain biking and even flying ultralight airplanes. But once we started being lazy, we found that we were really, really good at it, so we devoted the rest of our week to the time-honored traditions of eating, reading and getting massages. A good place to start is Le Tigre de Papier, where you can trade in your old paperbacks for new ones, check your email (free wifi! 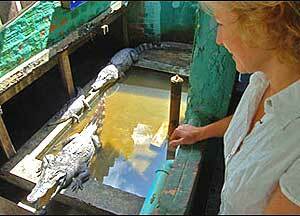 ), and sample their grill, which features local alligator and imported kangaroo. Le Tigre is located on the main drag, known as “Pub Street” (for obvious reasons), which is the best place to eat and drink away the evening. Everybody’s down here in the evenings, and most places have open-air tables sprawling out over the sidewalks. There’s a range of choices; try the Angkor What? if you’re looking for seriously loud music, or the Red Piano (said to be Angelina Jolie's favorite place) for a more laid-back scene. You can get most kinds of Western food around Pub Street -- the Soup Dragon is popular -- and there’s a great Indian place called “kamasutra.” Up the street, the Arts Lounge in the Hotel de la Paix serves a mean grilled tandoori chicken sandwich on raisin bread, and probably has the best burgers in town – in case you came to Cambodia to eat burgers. 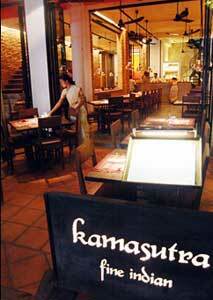 But it’s definitely worth trying Khmer cuisine. Like most of Cambodian culture, it was virtually wiped out during the Khmer Rouge period. It’s slowly making a comeback now, and its subtle mix of Thai, Vietnamese and Chinese flavors quickly gets addicting. Try Khmer House or Le Grand Café (both in the French Quarter), where dishes run $3 to $8. Also a lot of fun is the Dead Fish Tower (Sivutha Street), with bare bones Chinese and Khmer food, Edith Piaf on the sound system and six live alligators in a tank in the back. More spendy – and elegant -- is Meric, in the Hotel de la Paix. It’s about $30 a person for a six-course Khmer meal, but you can dine while lying in a hanging bed in the garden and watching traditional Apsara dancers by firelight. Life rarely gets better. And you definitely won’t want to leave Siem Reap without a massage from any of the dozens of spas around town. 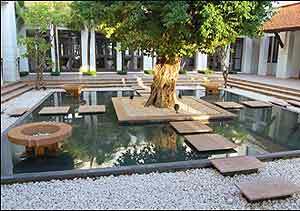 Some of the big hotels have their own – Spa Indochine, in the Hotel de la Paix, is phenomenal – but you pay a premium. Try a few of the local ones in the French Quarter, like Frangipani (whose menu includes a one-hour massage for $18, or a “tropical facial” for $28). The Seeing Hands spa (Sivutha Street) is staffed by blind Cambodians who have been trained by a Japanese aid organization; fairly basic massages for about $10 per hour. Our favorite, though, was Bodia, partly because it was so organically space age inside, with free-form wicker furniture, skilled masseuses, and a stream running through the building. At $26 for a one-hour massage, it’s not the cheapest -- but it was the best one we tried. But if getting pampered in a poor, developing country leaves you feeling guilty, there are also plenty of opportunities to do good in Cambodia. You don’t have to adopt a baby (unless you’re Angelina Jolie -- in which case, sure, go ahead), but several of the hotels offer tours of orphanages, schools, villages and hospitals, where you can see what’s going on and even pitch in, if you like. 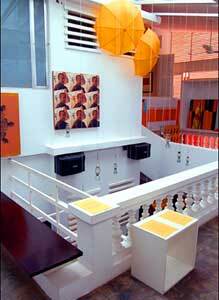 The Shinta Mani hotel runs several of these tours, and is a good place to learn more. There’s also an interesting character in town named Dr. Beat Richter, a doctor who runs a clinic for children. To raise funds, he puts on a classical cello concert in the Kantha Bopha Children’s Hospital every Saturday night. It’s a fascinating show -- he plays his cello, talks about the hospital, shows films, rants and raves about the failure of the big aid agencies to do what’s needed, and then passes the hat. Richter’s wound a little tight for some tastes, and the music’s only average, but the cause is well worth contributing to. Siem Reap fills up fast, so if you’re going in the high season (November to February) be sure to book your hotel as far ahead as you can. You can stay comfortably in town for under $25 a night at guesthouses like Villa Siem Reap, or spend about $1,000 a night at the ultra-luxurious Amansara resort (formerly a guesthouse for the Cambodian royal family). But there are plenty of hotels in the middle range; we tried the Hotel de la Paix and La Residence d’Angkor, both of which offer extraordinary luxury and excellent service for between $200 and $400 a night. Check out more options online for unique Siem Reap hotels and interesting Siem Reap tours. Stephen Brookes is a regular arts and music contributor to The Washington Post and other publications. He can be reached at stephenbrookes.com.